Would you give up your car to live in a better environment? A neighborhood free of cars. With the annual population increase, more people are living in cities; they are also becoming more mobile contributing to the mobility issues. Multiple players are continuously involved in this increasing mobility phenomenon. People and technology go hand in hand when it comes to improving transport systems and infrastructures. 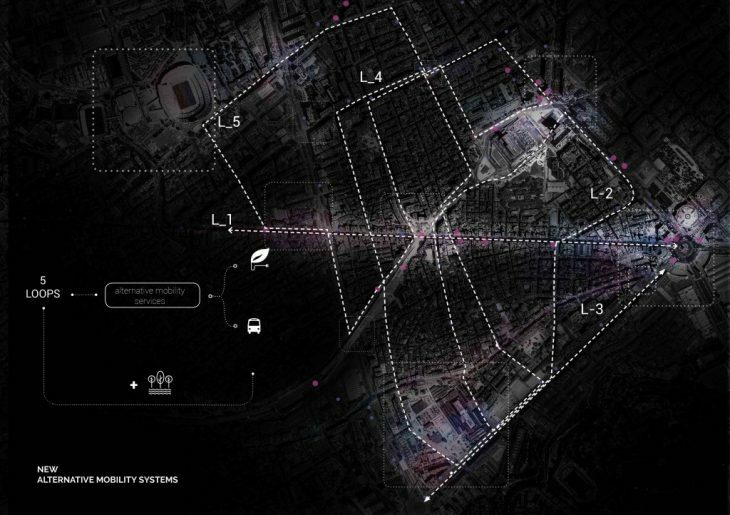 Our project is a proposal for the improvement of local transportation for the neighborhood of Sants, a neighborhood that is characterized by being an important multi-scale transportation node in the network of the city of Barcelona. It shares the same urban fabric of the old towns of Barcelona, however, it differentiates by its high car flows, low pedestrian activity, parking space shortage and traffic jams. Technology is an enabler for change, but is not the ultimate solution, we have to consider people as the center of our operations. According to experts, the goal today is to balance public space and transportation services, reduce pollution, noise, and stress. For us, the answer is to create a more walkable city. The car-free concept comes from the definition of a place where the population relies primarily on public transport, walking, or cycling for transport within the urban area. The advantages include improvement of the quality of outdoors public life, entitlement of the public space, healthy citizens, social interaction increase, pollution reduction and noise reduction among others. To apply this concept, we started by transforming the main car congested commercial axis Carrer de Sants that was fracturing the neighborhood fabric, into the first pedestrian street of the project. Secondly, we assigned the same function to Carrer de la Bordeta to achieve activity in the less congested area that soon will receive many new residents in south part of the neighborhood. We had to consider that traffic would need to be redirected and that a complementary new local mobility network would have to be implemented. Therefore, we included in the project two bus lanes for Carrer de Sants, a cyclable way for Carrer de la Bordeta, 4 centralized free parking areas for residents and workers of the neighborhood, the improvement of interchange gateways that connect to the metropolitan networks, and 4 small scale public vehicle loops that will interconnect the main polarities of the district with the inner areas of the neighborhood. We wanted not to impose a top down pedestrianization plan for the neighborhood. In 2015, Boyd Cohen, an expert in innovation and Smart Cities criteria, described the third generation of Smart Cities are the ones that include citizen co-creation. In view of the concept of citizen participation, our project became a dual function project that benefits from the overlapping between a top down and a bottom up approach. Working with technology would allow us to develop and app. OWN IT is a complementary vision for a Sants free of cars. An emerging plan based in the concept of bottom up that has as main focus on allowing the citizens to decide on the activities, materials and role of the intended to be liberated public space in the neighborhood. 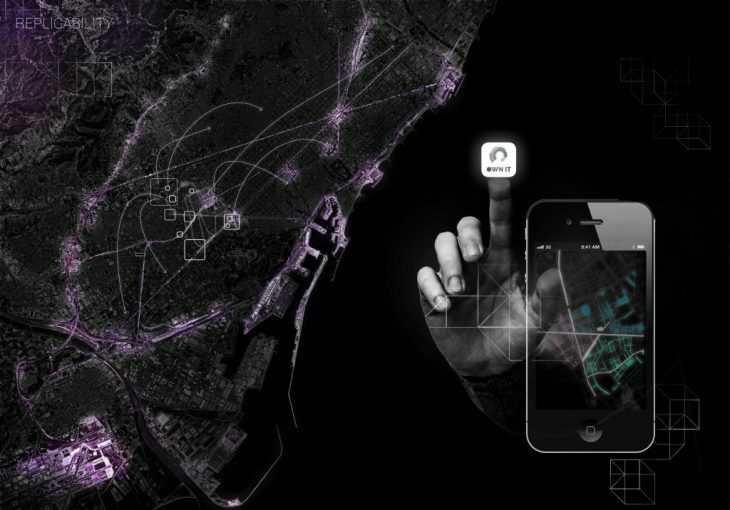 An app that would promote street ownership and access to data, environment sensors, real time street views and other mobility apps, and that would introduce dynamic infrastructures to respond to the dynamic uses of the public space. For up scaling, we thought that the citizens should choose which other streets have the possibility to become temporarily or permanently pedestrian. 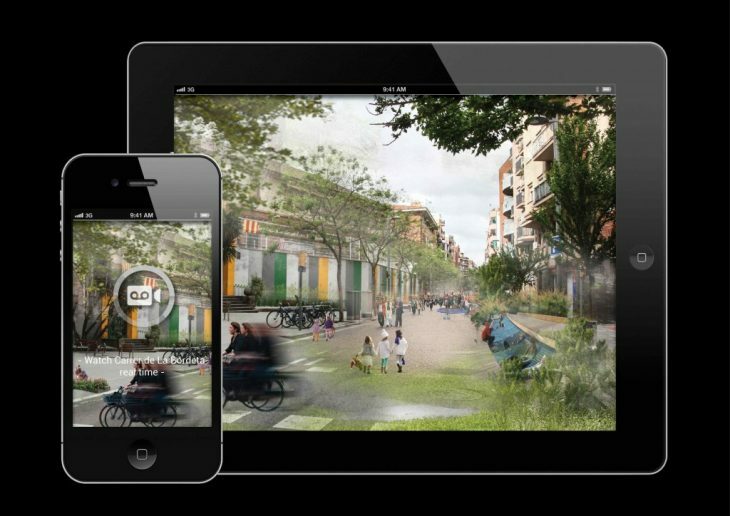 Through the app, we planned for citizens to select the time and date of this pedestrianizations, and progressively have bottom up based car reduction and increased social activity. We see these interventions not just as an opportunity to improve the transportation and the environment in the local scale, but also as an opportunity to promote and re-think a broader set of policies at the city scale.